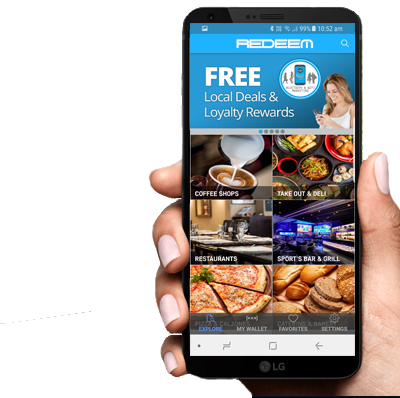 By using Redeem Rewards you will greatly increase your brand recognition by engaging with a broad audience of consumers in your local area. Anyone who has the Redeem app on their Android or Apple device can see your offer even if they have never shopped with you before. Customers can easily share your offers or incentives within the app. Redeem has built in every kind of social share you can imagine, email, SMS and more! 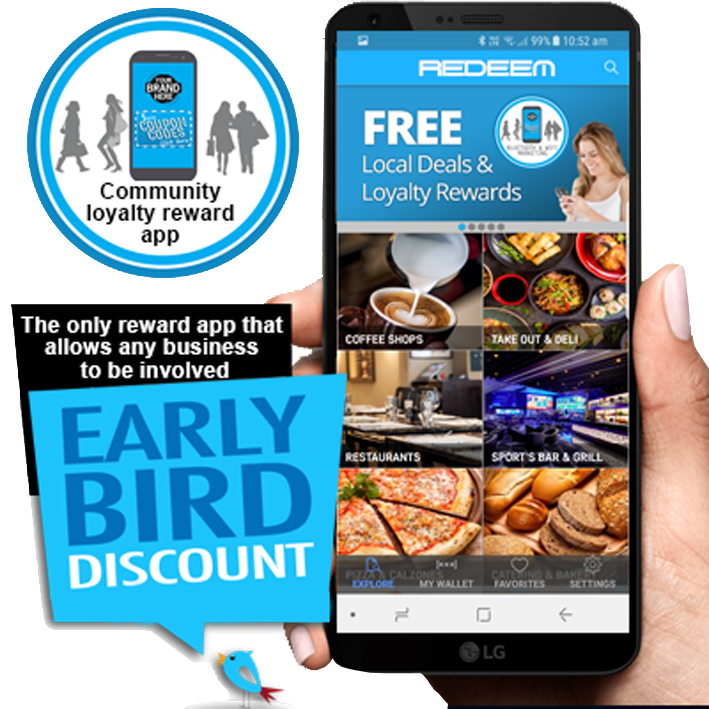 Redeem allows small businesses, e-commerce sites, retail stores, shopping centres, local traders and services to be part of our online community. Offering loyalty and coupon offers to the potential local customers all on a convenient app that is geo-targeted. At only $1 a day, your business can become part of the Redeem online rewards community. Every time a customer uses your Redeem offer, you will receive a notification in your control panel that includes their email address and phone number, so you can grow your email marketing database. Develop a loyal customer base by interacting with customers. When you interact with customers, it drives loyalty to your brand. Loyal customers spend more with you, stay with you longer, and tell their friends about you. Our app places all its users by location on one convenient platform, in a sense, creating a digital web directory that allows browsing customers to easily find what local service, product or online store they are looking for and view offers on the one device they never leave home without – their mobile phone. Easy-to-use social sharing. Send new offers to customers via Facebook Messenger! Does not require a plastic card or key ring fob to work. Won’t break down, so no missed opportunities or frustrated customers. No more paper stamp cards, or business cards. It’s not just another card in your customer’s wallet or purse. No more wallets full of plastic loyalty cards. No need to keep printing reward cards. Unlike our competitors, we don’t take up valuable shelf or bench space. No more staff wasting time trying to explain how to use it, customers simply scan your QR code using their mobile phone. Users can browse Coupons & Loyalty Cards available in the Redeem Rewards App. Users Save Coupons & Loyalty Cards they want to use to their in-app ‘Wallet’. The user then visits your store or website, presses ‘Redeem or Collect’ button on a Coupon or Loyalty Card. The app’s built in QR code scanner opens automatically via their Smart Phone’s screen and they simply scan your Merchant QR code that we provide to redeem the Coupons or Loyalty Card stamp. Users then receive an in-app notification that the Coupon has been redeemed or that a Loyalty Card Stamp has been applied. Once they show the redeem stamp on their phone to you the merchant they can receive your offer or reward. As the merchant your will also receive a notification plus their email address and phone number so you can add them to your EDM or SMS campaigns. Whether you are a mobile business, in a shopping centre, home office or high street location you can take advantage of Redeem Rewards. Don’t worry, if your category is not listed we can create it. Professional App with the latest Technical, Design and User features and functionality. Coupons & Loyalty Cards in the App feature a “find us” tab, when clicked it shows the Merchant’s location on Google Maps. Redeem provides directions to find the Merchants location. Users can log into the app via their Facebook, Google or Twitter accounts or create their own account. Users can share Coupons and Loyalty Cards with their friends and family via social media (Facebook, Google & Twitter) Email and via SMS. Yes, you can change your plan anytime at no extra cost. Simply email info@redeemrewards.com.au to request the change. 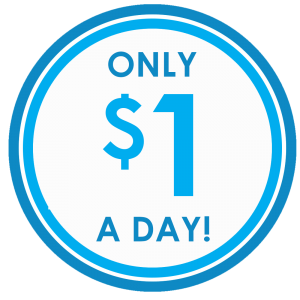 For ONLY $1 a day, no set up costs, no lock in contracts. Once your initial 4 week free trial is over and you’re happy, then we simply charge you on the 1st of each month (please select the monthly subscription to activate the 4 week trial). You will have the option to pay monthly at $30 or an annual payment of $324 (save 10%). And advertise your Redeem Rewards!